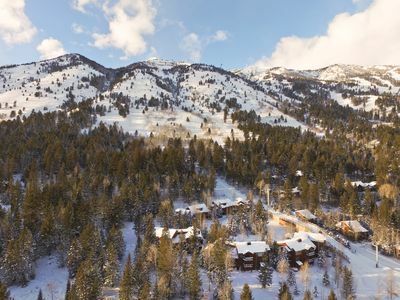 The Moose Creek Condos are situated at the base of the Moose Creek chair lift in Teton Village. 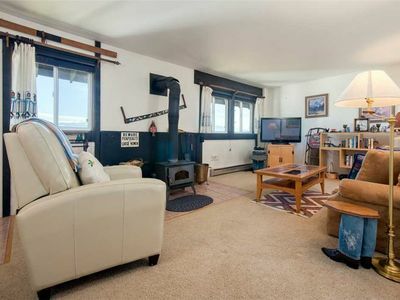 This 3-bedroom, 3-bathroom town home offers 2600 square feet of refined living space, decorated with upscale furnishings and unique art pieces. 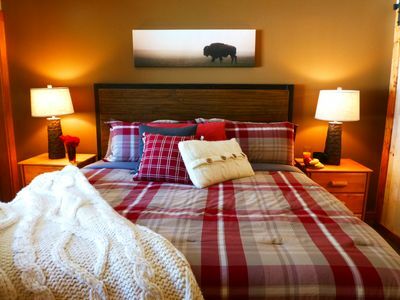 There is comfortable bedding for up to eight guests. 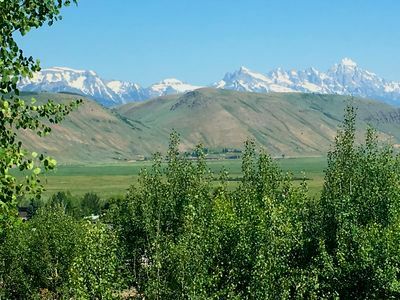 Situated on the quieter side of Teton Village, Moose Creek is the perfect place to stay in both winter and summer months! 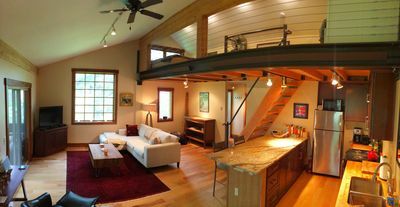 On the main level, guests are greeted by a cathedral ceiling and open floor plan with bright windows. 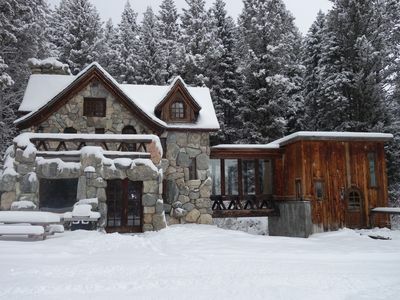 Enjoy the magnificent view of Rendezvous Mountain while enjoying the warmth of the gas fireplace and comfortable sofa. 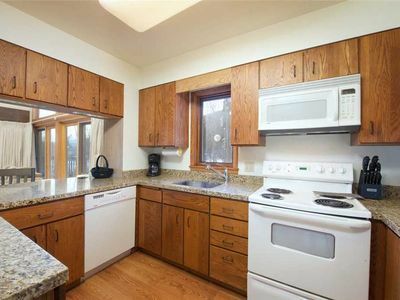 The kitchen is fully equipped with stainless steel appliances, dark granite countertops, All Clad cookware, and plenty of quality glassware and china. 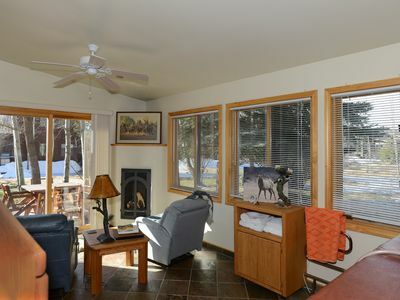 Glass doors open onto a patio with a gas grill, patio table, chairs and hot tub. 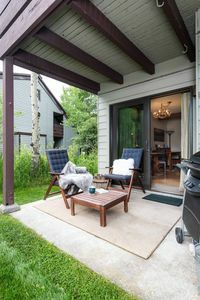 Another set of French doors open to a covered balcony with its own table and outdoor shaded seating area. 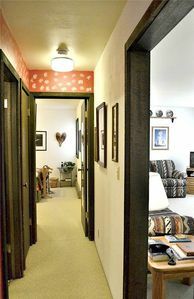 The main-floor guest suite offers a king bed, a comfy armchair and ottoman, large closet, Western photographs and decor, a window framing the mountain view across the valley, a slate-tiled ensuite bathroom, and a Wi-Fi streaming flat screen TV. 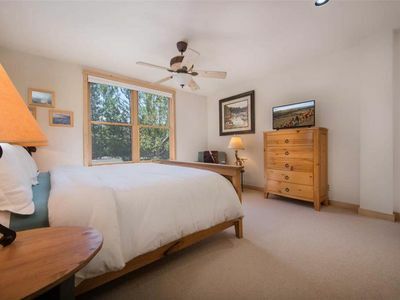 The third-floor offers a spacious and private master bedroom with lodge-pole pine king bed, an antique work table, and a walk-in closet. The ensuite bathroom includes a double vanity, tub and glass shower. 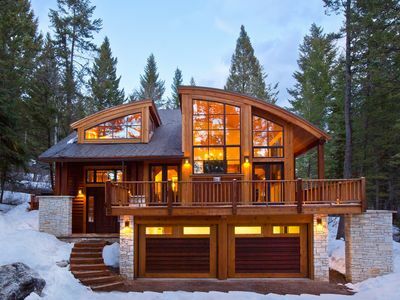 French doors open to a sunny, rooftop private deck with views across the valley. 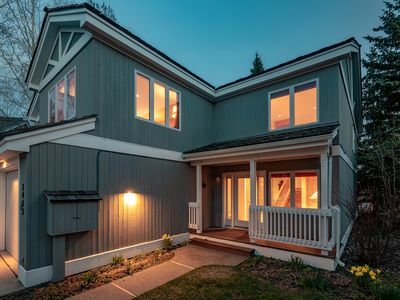 The ground floor features a garage, laundry room and a bedroom with two twin beds, a Wi-Fi streaming flat screen TV and an ensuite bathroom. A mudroom provides a place to store wet ski clothing and a bench for taking off boots and gear. 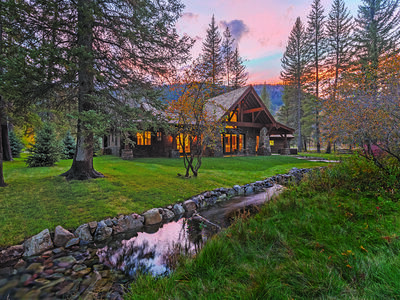 Moose Creek Townhomes come with complimentary access to the nearby Sundance Tennis and Swim Club. 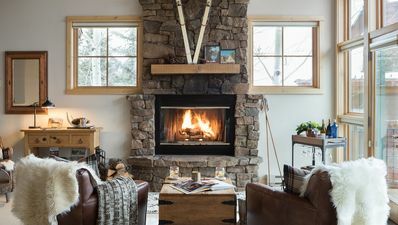 The boutiques, bars, restaurants, and ski shops in the heart of Teton Village are within a 10-minute stroll. 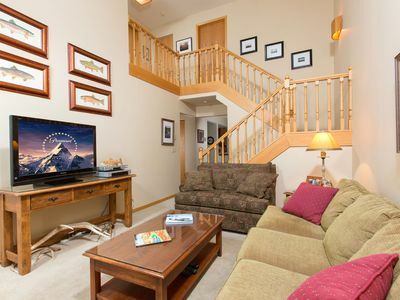 Nestled at the base of Rendezvous Mountain on the southern end of Jackson Hole Mountain Resort, this townhome is literally steps away from the Moose Creek chairlift, making it truly ski-in, ski-out. A frequent shuttle links guests with the rest of the resort base area (also within walking distance). 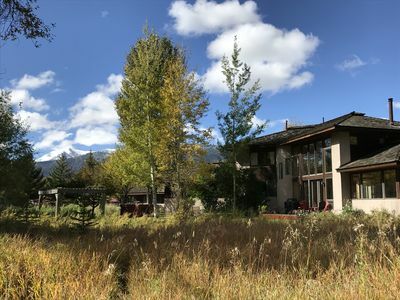 Unique 2 Bedroom with Loft in the Aspens! 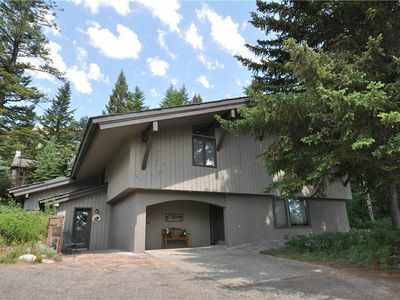 RMR:Large 5 Bedroom Lodge in Teton Village! 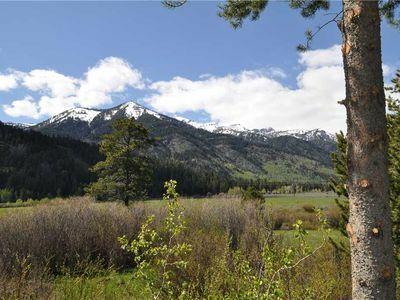 Close to National Parks, Free Activities Included! 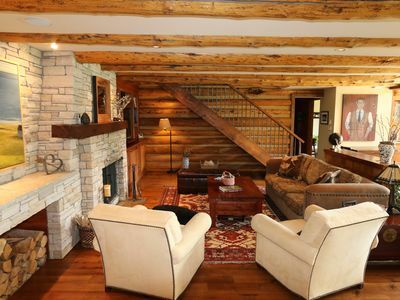 Spacious Cabin with Private Fish Creek Access - a True Fisherman's Dream! 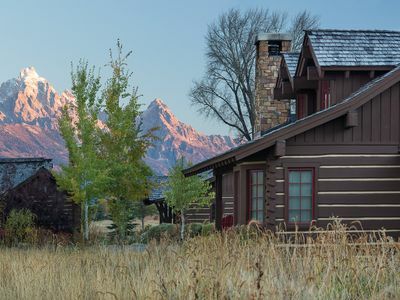 Jackson Hole Townhome 2 minutes to Jackson, near Yellowstone. Indoor jacuzzi.